half done. The first pair that she ever attempted to knit. The day before had rained “pritty fast” all day long, and today opened in much the same vein, with “snow squals + rain + a high wind.”*** The women stayed indoors and focused on fashion. Dressmaker Julia Mahoney came over to work on new outfits for Evelina. Sisters-in-law Sarah Ames and Sarah Witherell helped for a time, too, both of them as accomplished at sewing as Evelina. They all “got along nicely,” a phrase that suggests good progress was made on Evelina’s dresses, although the women’s sociability quotient was also probably pretty high. Others joined the hum. Nieces-in-law Hannah Gilmore and Augusta Gilmore, a younger set of eyes and hands, arrived with work in hand. Hannah helped her little cousin, Susie Ames, knit a pair of stockings. Things would change. 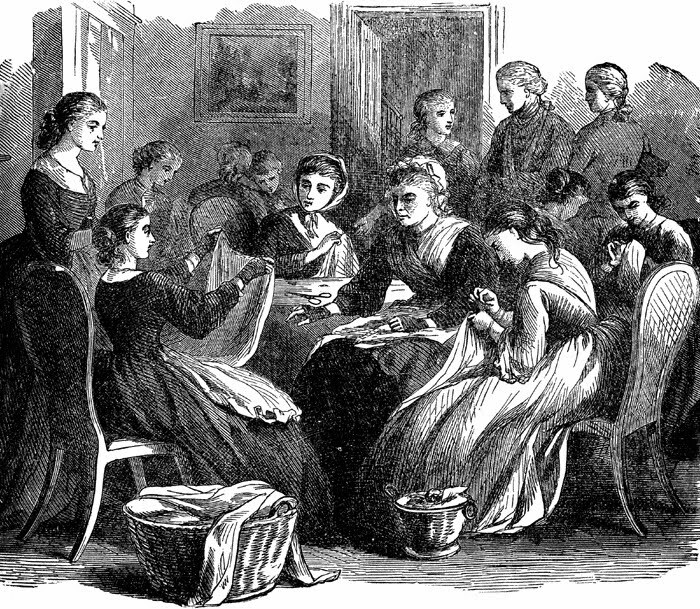 By the start of the Civil War, the Ames women began to have their dresses made up in Boston. But on this day in North Easton, needles flew.